Stephanie moved to PEI from Quebec 11 years ago. Her goal was to learn English. She was amazed at the help she received from the people she met. She was able to find jobs doing tourism surveys, and work at La Voix Acadienne, and Fédération of parents PEI. She also worked as a French monitor at Elm Street school, and as a receptionist in a dental office. 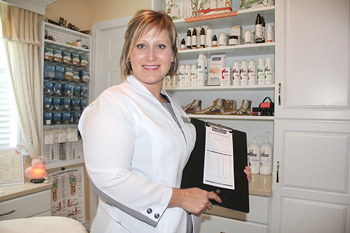 In 2011, she decided to open her own business and do what she loved – foot care. “I wanted to give a service that is personalized and adapted to the needs of each client,” says Stephanie. She graduated from an Aesthetics program in Quebec. . In 2014, she took an advanced foot care program, with North American School of Podologie and just upgraded her Podologie skill last November 2016. Stephanie visited the SkillsPEI office in Summerside to talk about starting her business. She was eligible for assistance through the Self Employ PEI program. It is an employment benefit program designed to help people start and succeed with owning and operating their own business. Participants receive financial assistance as well as business counselling and ongoing support from SkillsPEI. At first, she was offering only a mobile service. By 2012, Stephanie’s father-in-law and her husband had fixed up a room in their house as a foot care office, and the business has grown since then. Stephanie would like to hire a part-time assistant within the next few months. The duties will include receptionist, bookkeeping, assisting with disinfection of instruments, laundry, and scheduling appointments. Besides the services offered out of her home, Stephanie travels regularly to seniors’ homes and seniors’ apartments in western PEI. She also have partnership with The Coop The Chez-Nous in Wellington, The coop senior home in Tignish, and coming soon community center in Tignish. “I am very comfortable working with my clients, but the administrative duties are still a learning experience. I would tell people not to be afraid to admit what they don’t know, and ask for help from RDÉE and CBDC. For more information about the Self Employ PEI program, visit www.skillspei.com and click Programs for Job Seekers.